The International Olympic Committee president says he has confidence that Russian authorities will deliver a "safe and secure" Games in Sochi. The president of the Ghana Athletics Association (GAA), Prof. Francis Dodoo, has urged all junior athletes to use their talents to further their academic ambitions in order to remain relevant to society in future. Ghana’s senior female hockey team have positioned themselves well to pick one of the continent’s tickets for next year’s World Cup in Holland after thrashing Tanzania 18-0 and drawing 1-1 with powerhouse, South Africa. This was after two days of action at the ongoing Hockey Nations Cup at the City Park in Nairobi, Kenya. The Ghana Cricket Association, with the kind permission of Ashanti regional office of the Ghana Education Office, embarked on a mass schools cricket coaching programme in some selected schools in the Kumasi metropolis. Cyclists from 12 African countries participating in this year’s ECOWAS International Cyclist Tour have arrived in the country to continue the 450km tour. Ghana’s search for fast runners in the country came to a thrilling conclusion last Saturday at the Baba Yara Stadium in Kumasi, with Emmanuel Dasor and Beatrice Gyaman establishing themselves as the fastest athletes out of over 40 competitors. they won the biggest cash prize in Ghana’s athletics and bragging rights. Former Accra Milo Marathon champions, Godwin Adukpo and David Zigah, are relishing a comeback in grand style next year after being ruled out of this year’s competition due to diverse reasons. The 27th edition of the Accra Milo Marathon last Saturday produced a new winner, Alhaji Mohammed Kassim, who beat Kenyan Alex Kimeli to grab the GH¢12,000 cash prize at stake. 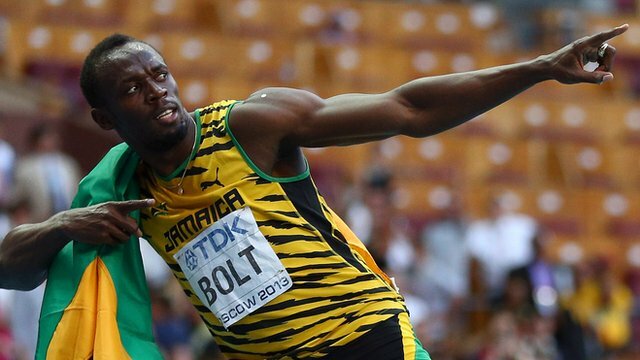 Usain Bolt says he would probably only run the 200m if he decides to compete at next year's Commonwealth Games. The 100 metres trials for the Tecno Ghana’s Fastest Human (TMGH) competition for athletes in the Greater Accra, Volta and Eastern regions would be held at the El- Wak Stadium in Accra on Monday. Tunisian giants, Club Africain, have announced the capture of Tema Youth duo, Francis Narh and Derick Mensah, for an undisclosed fee. A 21-year-old graduate of Akim Oda Senior High School in the Eastern Region, Kwabena Frimpong, last Saturday won this year’s Papaye Homowo Marathon, finishing with a time of 58 minutes and two seconds. Organisers of the Tecno-sponsored Ghana’s Fastest Human competition have set August 31 as the deadline for registration by potential young athletes for the novel sports reality show that seeks to unearth and develop talented athletes for future sporting and academic careers. Leeds United forward El-Hadji Diouf has insisted he is happy at the club after being linked with a move away.